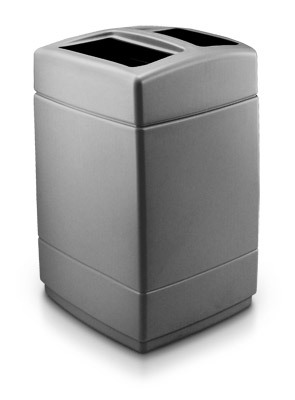 These 55 gallon square waste containers are contemporary, stylish and practical. The attractive containers have an extra large dual sided trash capacity. Perfect for any high traffic environment. 50% Post Consumer Recycled Plastic. Shipped in a 50% Recycled Content Carton. Extra Large 55 gallon capacity, perfect for high-traffic areas. Easy lift-off lid and Grab Bag™ System hold trash bag in place. Use standard 55 gallon trash bags. Includes two 27.5 gallon removable liners. Molded from long-lasting, high-density polyethylene to withstand the harshest weather environments. UV inhibitors added to limit fading in bright sunlight. ► Items ship within 72 hours on orders up to 10 units.